In 1974, things went from bad to worse for Badfinger as Warner Bros. ended up pulling their second release after seven weeks in the stores due to their manager squirreling away publishing advance money, prompting a lawsuit by the label's publishing arm. Yet, somehow in the midst of all the chaos, the band delivered its masterpiece. 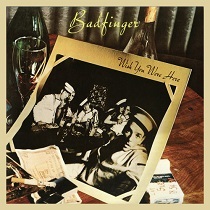 Recorded by Chris Thomas at the Caribou Ranch studio in Colorado and George Martin's AIR studio in London, “Wish You Were Here” stands as Badfinger's most cohesive and powerful artistic statement, with stellar contributions by all four of the band's songwriters. It's an album without a weak track, so it's hard to single out any songs, but Ham's "Dennis," Molland's "Love Time," and Evans' "King of the Load" might take the honors. For this Expanded Edition (which offers a new remastering of the album for the first time since it was initially released on CD), Real Gone have unearthed an unreleased song ("Queen of Darkness"), and uncorked eight new remixes that highlight many un-used vocals and novel instrumental arrangements. Matovina's notes include exclusive quotes from original producer Chris Thomas. The last and best record with the original line-up, now fully unveiled! GREAT! !